The Surface Science Package consists of nine independent sensor subsystems with the primary aim of characterising Titan's surface at the end of Huygens' descent through Titan's atmosphere. In addition, many useful atmospheric measurements will be performed during the descent phase. Seven sensors are mounted inside or on the lower rim of a cavity in the Probe's foredome, and are thus exposed to Titan atmosphere or surface material. Two sensors which do not require direct exposure to the atmosphere or surface are mounted on the electronics box inside the descent module. The SSP addresses its science objectives through a suite of nine measurement subsystems selected to provide at least partial characterisation of either a solid or a liquid surface at the landing site. Seven of the sensors require intimate contact with the surface material and are housed in a 100 x 100 mm square cross-section cavity, known as the top-hat, cut out of the Probe's foredome and extending to the main experiment platform. Venting of the top hat is achieved through a 5.5 mm inner diameter tube from the Top hat to the Probe's top surface. The Huygens Probe in surface configuration is shown here in section. The accommodation for most transducer subsystems is shown, with a vent extending to the top platform. This vent ensures that access to Titan ocean fluid is available to those sensors that need it; it does not have to be a straight tube to fulfil this function. This 'Top Hat' configuration eliminates the need for either deployment mechanisms or the use of a large area of the front shield surface, thus avoiding competition with the radar altimeter antenna, ACP or GCMS inlets. Schematic of Probe in surface configuration with components of Surface Science Package. The accelerometer subsystem will consist of two piezoelectric sensors mounted on a suitable structure, ensuring a known response of the Probe structure to surface contact, the penetrometer (ACC-E) on a spear, the other (ACC-I) on SSPE. The ACC-I will also measure atmospheric and surface accelerations. The tilt sensors work on an electrolytic principle and consist of platinum terminals and a methanol based liquid enclosed in a sealed glass housing. Fluid damping is included to improve operation in moderate dynamic environments. An individual sensor element is very small and senses the local vertical about a single axis. Two elements will be used to give the tilt angle in any plane, and both are mounted on the electronics box. The TIL sensor shall be aligned with one axis on a radius from the platform/Probe central axis (to within 110). The thermal properties sensor assembly makes measurements of the Titan ocean and lower atmospheric temperature and thermal conductivity. It is housed in the SSP Top Hat. Conventional sensors for this purpose are platinum wires 5 cm long and 10 and 25 microns in diameter. The thermal conductivity measuring technique is to pass a current through the wire to heat it and the surrounding medium. A series of resistance measurements are taken at approx. 0.1 s intervals to measure the rate of heating of the element and detect the onset of convection. The acoustic properties sensors are small piezoelectric ceramic devices similar to those used in marine applications. There are three transducers: two are used in both transmit and receive modes alternatively for the velocity of sound measurement (API-V), the third is an array of elements used in dual mode for the acoustic sounder (API-S). The first two face each other across the diameter of the Top Hat. Propagation time between the transducers will be in the region of 150 microns. The third transducer points vertically downwards to obtain a return from the bottom of the ocean, or the Titan surface during descent. Atmospheric sounding may also be possible with API-S. 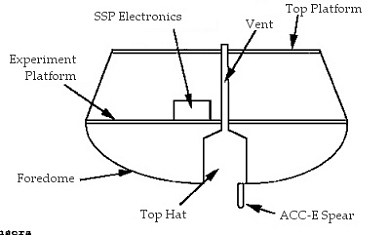 The PER sensor consists of simple electrodes, within the Top Hat experimental volume, whose capacitance will vary with the permittivity of the material between them. In addition, a conductivity measurement (CON) will be made. This may provide a measure of any polar molecules in any Titan ocean. The density of any Titan ocean shall be determined using an Archimedes buoyancy sensor, the displacement of a float by the surrounding liquid medium being determined by the use of four strain gauges in a bridge arrangement. The refractive index sensor is a specially shaped prism with two LED light sources providing internal or external illumination to the curved surface of the prism through light guides. Light passing through the top surface of the prism will be fed into a linear photodiode array. All of these components will be built into the Top Hat sensor assembly. The refractive index is determined from the position of the light/dark transition on the photodiode array.